Although EPDM rubber is a hard-wearing, sturdy and reliable roofing material, you may still encounter problems with your rubber roof over time. In most cases, issues with rubber roofs are caused by poor installation or a lack of maintenance. However, these issues can often be easily resolved and prevented in the future. To help you out we’ve created a guide to three of the most common EPDM rubber roofing problems below and we’ve also included some tips on how to deal with these issues. Leaks can be a real problem for rubber roofs that haven’t been properly maintained, particularly during periods of heavy rainfall. EPDM rubber is a waterproof material that should protect your home in all weather conditions. However, if you’ve had poor installation or little maintenance, leaks can still occur during rainy periods. As soon as you spot a leak, it’s important that you identify the source and get a professional in to inspect and repair your roof. While a DIY job might work for a short while, it’s important that you get the roof repaired by an industry professional or the problem can worsen. Another common entry for EPDM rubber roofing problems is puddles of water forming on your roof. 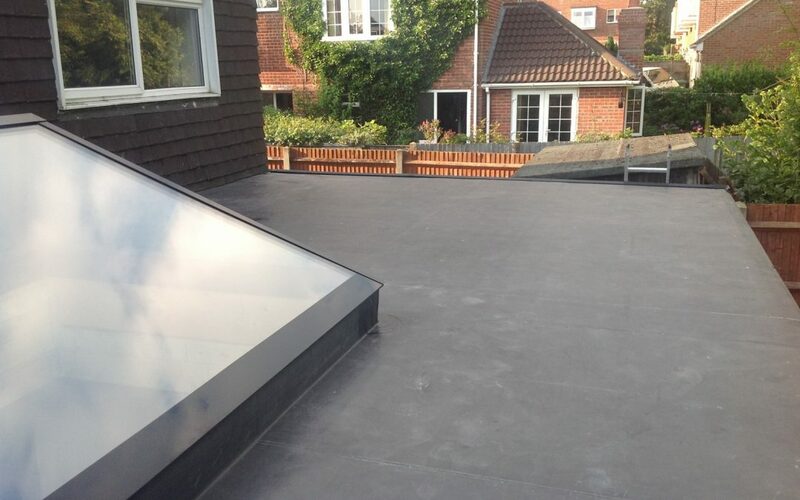 Your flat roof will be level when it’s first installed, but houses can actually shift over time which can lead to a change in the roof’s structure. As a result of this, water may start to pool on your flat roof. Properly installed EPDM rubber should be able to withstand the water without absorbing any, but it’s still important to drain any puddles as soon as you spot them. Regular maintenance and inspections will help to identify any problem pooling areas on the roof. While many EPDM rubber roofing problems are linked to water, another issue that you may encounter is shrinkage. This can happen because of poor installation, an old and poorly maintained roof and exposure to direct sunlight. A shrinking roof can pull the flashings from the side, resulting in splits and cracks on the surface. This can eventually lead to leaking. Roofing professionals can replace your flashing and a proper installation should prevent any future issues. Hopefully this guide has helped you to understand any EPDM rubber roofing problems that you may encounter with your home. You should have your roof inspected around twice a year to ensure that any problems are detected and dealt with early on. Have a look at our blog post on rubber roof maintenance inspection to find out more information about this process. If you would like to book a rubber roof inspection or you are worried about a problem with your roof, please do get in touch with us.